Out of his experiences as a wartime ambulance driver in Italy (and Germany), John Hawkes distilled two haunting, obsessive short novels set in a landscape partly Italian and partly the author's own brand of myth and fantasy. 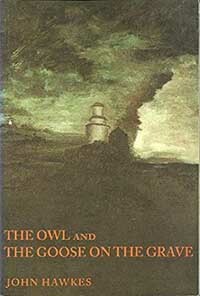 THE OWL and THE GOOSE ON THE GRAVE, first printed in 1954, were intended as companion pieces to THE CANNIBAL (1949), Hawkes's first novel and classic vision of a neo-Nazi uprising in an imaginary Germany. THE OWL takes place in a medieval citadel that is suggestive of the little principality of San Marino and is as symbolic of tyranny as the bastion in Stendhal's THE CHARTERHOUSE OF PARMA. The story is told on several levels, the Fascist narrator being the provincial Hangman, ruler of the people, sought-after bachelor, and, at times, the dictatorial and ruthless bird of history, the owl himself. There is a victim who is hanged to satisfy an almost ceremonial sense of guilt, a village festival related to the fertility of the town's marriageable virgins, and a great deal of chiaroscuro scene-painting which recalls the grotesque period of post-Renaissance art. THE GOOSE ON THE GRAVE narrates the wanderings of a small Italian child orphaned by the war, the bombings, the holocagueust described as "the survival of the least fit." The boy seeks a father in a wounded, deranged soldier, in an elderly rogue, in a priest, a blind man, and in a menacing accordionist. Readers interested in returning to the beginnings of John Hawkes's remarkable forty-year career, and who seek what was evident even then - powerful visualizations and elaborate prose rhythms, all that is as terrifying and exciting as the Elizabethan shudder - will find their pleasure here.